Institches with Bonnie: Give Away! I had planned (mentally) a give away around my 10,000 visitor. 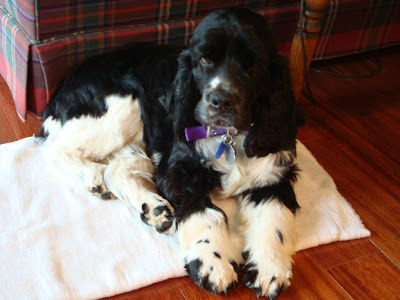 But, I think Raggs came up plus a mention on Kim's Big Quilting Adventure which garnered a huge number of hits so I am way over 10,000 hits, actually well on my way to 11,000. So, today, I begin my give away. 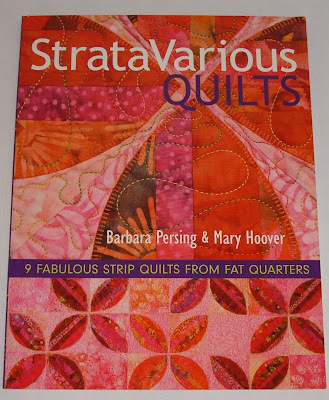 The prize is this copy of StrataVarious by Barbara Persing and Mary Hoover. It has some wonderful quilts in it. My DD ended up with the copy I gave her at Christmas and one from her brother. I'll borrow hers if I want to do any of the quilts. But, heck, I have a hundred quilts from my own books still to be made! I haven't decided if there will be a second prize or not. I'll be snooping through the studio to see if there is anything. Maybe a fat quarter or two of my hand dyed fabrics. Here's the plan. Leave a comment on my blog. If you do not have a blog that lists a way to email you, make sure you leave your email with your comment. Let me know what your current project is -- you don't have to write a book. You'll get an additional entry if you post a link with information about the give away on your blog. The cut off will be based on the time stamp on the comment -- 11:59 pm on Wednesday, 5/6/09. So today, we were going to church and Raggs was going to be by himself for about 5 hours. We moved most of the stuff he could get to off my night stand. We moved the big basket off the floor. We moved the stuff off the phone table. You get the picture. Five hours later we come back. Raggs had moved his water dish from the hardwood floor on to the carpet without spilling a drop -- don't ask me how as it was a heavy bowl! But he decided to try for my pillow again but without much luck. He did pull tufts of fur off a rug I had on the floor. Oh well. But there was no other damage. And, he must have exhausted himself as he's been asleep for the last hour. Until yesterday Raggs didn't jump up on his hind legs at all -- or at least not that we had ever seen. Rescue thinks he had been hit by a car before he was found. He had surgery on his leg and hadn't been using it much. He is now using it more especially when we take him for his walks. So, the jumping up on the hind legs was a big surprise! I've got your number Mr. Ragg Man! Time to hit the studio and sew! I have to sew the rows together on the wonky 9 patch and then decide about borders. Congrats on your new family member!! He's a cutie. :o) I currenty have 2 projects that I am working on. The one on the top of my stack is a patriotic table topper. I am using scraps from my first quilt to make it. I also need to machine quilt a baby quilt for my new nephew. I hope your stashbusting will start to pick up speed. I posted about your giveaway on my blog. I have to laugh at the other people. Only two projects at a time? Wow! I currently have about 50 projects in the works, so many I can't count. But the most important ones include my quilting ministry at church, we are making quilts to send to Kazakhstan to an orphanage and to the missionaries and their families there to remind them they are not forgotten. I also am the area coordinator for Binky patrol so have quilts in the works for that plus have to make a quilt for my principal who is leaving at the end of the school year. It is a t shirt quilt and I really should be cutting up those shirts. I have to make a quilt for my friend who finally graduated from college and one for the room mom of my preschool son. That's just what I can think of while sitting at the computer. My sewing room is a disaster from all of the fabric pulling I did yesterday, trying to put together quilt kits for others to cut and sew so I could quilt them. Whew, I'm tired. I think I will take a nap with Raggs! He's a cutie. I am cross stitching a biscornu and I have to finish a black and white quilt top. Then there's the quilt that's basted and needs to be quilted and the lap quilt that should be sandwiched and quilted...That's it so far as I can remember - it's a senior's moment. Congrats on the huge number of hits. He probably wants the pillow because it smells like mommy. :) I need to make some tops for summer right now. I love following the saga of Raggs. He is so adorable! Glad to hear Raggs is adjusting. And what a great giveaway...... never would have thought of a book. I'm binding a scrap quilt by hand, waiting to machine bind another scrap quilt, and getting ready to start the Marie Antoinette quilt from Timeless Treasures. Congrats on 10,000 hits. Remember, don't draw my name! good luck training him, bet he just needs lots of love and attention!!! I would love this book thanks for hosting a giveaway! Love your wacky nine patch. The colors are great! I am working on a storm at sea(among others) that seems never ending. Hope to finish it up fairly soon. Congrats on the cute cute puppy. This is a fun giveaway. The book looks very interesting. Thanks for having this giveaway. I'm working on several projects at a time. Pretty ambitious for a newbie. LOL Top of the list is a breast cancer quilt for a friend and chicken blocks for a swap. Just finished some blocks for QFK. Thanks again. I would love a copy of the book. I am a rather new quilter having only finishing a baby quilt for my new grandson who will make his entrance into this world next month. I am also working on the Winter Wonderland quilt by Crabapple Hill. I love doing hand stitching work too. Behind the Closed Door . . .